This traverse off trail is about 8 miles; it can be done in a day by a strong hiker descending the Constance Pass trail to the Doeswallips River trail and road (6.5 miles on trail; 14.5 miles total), but two or more days are recommended. You can return 12 miles to the Dungeness River road via Home Lake and the Dungeness River trail for a 27-mile loop: 19 miles on trails and 8 miles cross-country. From Constance Pass, other return route are also possible. On the north end, this traverse can be linked with DD1 (Gray Wolf Ridge to Royal Basin). See the published Climbers Guide for detailed approach information. From Royal Lake, hike S up the valley. The brushy section just above the lake is the only difficult terrain in the open, scenic valley. At the head of the valley, ascend a steep slope to the divide E of the remnant glacier on the NE side of Mt. Deception. From this ridge, descend open slopes to the basin at the head of Deception Creek. Continue downstream from upper Deception Basin to the valley leading SE to the notch between Mt. Mystery and Little Mystery. Ascend scree or snow to this notch (Gunsight Pass). 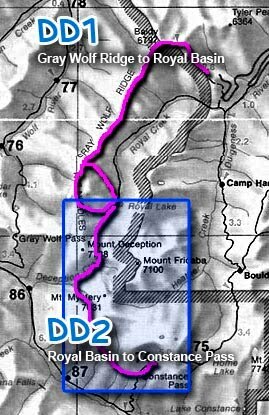 From Gunsight Pass, traverse E to gain the ridge between the Dosewallips and Dungeness drainages and follow it to a point where you can drop into Sunny Brook Meadows and the trail to Constance Pass. The section between Peak 6666 and Peak 6576 is broken and best avoided by dropping to the meadows even if you are continuing E to Constance Pass.